Why Bing Doesn't Index Sitemap of Blogger Blogs? For most people (and webmasters), Google is the only search engine, or at least the only worthy search engine. Granted that it controls two-thirds of the market. But with Bing and Yahoo! partnering up, they control a quarter of the market share as well. So it's time we paid more attention to Bing, because unlike Google Search, things don't just magically happen with Bing. For example, Bing doesn't easily index sitemaps for Blogger and WordPress blogs. Apparently, Bing's indexing system is quite different from that of Google. In Google, you simply have to submit your sitemap to Webmaster Tools, and it will automatically index your blog after a few days. 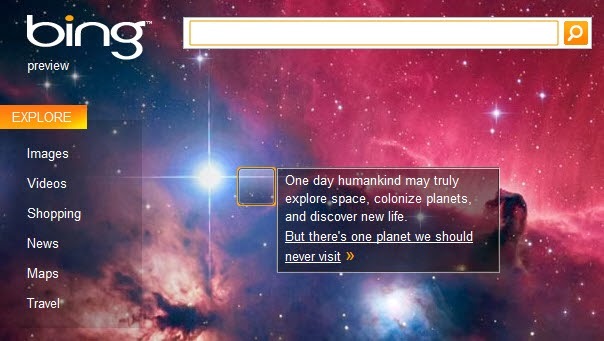 But with Bing, there's no knowing when your blog will be indexed. Often times, it simply doesn't index your sitemap. Bing's community forums are filled with complaints just like this. There's a reason why Google owns the market space. It has a mature and sophisticated search engine, whereas Bing still needs to learn a lot. Perhaps we're too used to Google by now to enjoy the features offered by Bing. But be that as it may, Bing is still in its infancy, and have yet to develop the rich indexing capabilities offered by Google. Here are some of the ways the Bing search engine works differently from Google. Page size - Back in the days of old, Google used to limit page sizes to 100K, at which point its crawler would truncate, and stop further crawling of a page. Now, that limit is gone. Bing, however, still retains such a limit (of approximately 100K). This results in an incomplete crawling in case where a page size is large, or contains rich media. Redirections - Bing, unlike Google, doesn't support 302 redirects. Google works with both 301 or 302, but if a website returns a 302 to Bing, it refuses to follow and index that page, and sometimes refuses to index the website altogether! Canonical pages - Bing doesn't support canonical tags either. It relies on the web-developer to handle canonicalization from a programmatic standpoint. Bing initially accesses a domain without the "www" part. If a 200 (OK) is returned, it keeps that version. If it finds a 301, only then will it go to the www version. 302 errors are discarded as discussed. Backlinks - Google clearly has the largest index. In years past, Google made a big deal about how many web pages were in their index. These days, they don’t really brag too much about their index size as they have won that battle. Bing doesn’t even play. Instead of seeking to index each and every piece of content available on a domain, Bing actively removes web pages from their index if those pages are not found to have enough link authority or value to rank in their SERPs. wow, its really a helpful information bro. Above mentioned points are awesome and informative. thanks for sharing this useful article bro. hello Qasim! It's been a couple of days that I've missed your article but I was thankful for you give me this time with an very good one...Hope you will not stop this mission .May God Bless This MBT forever!